The Turkish Cypriot Chief Negotiator, Kudret Özersay, told London audience that they need to take Greek concerns into consideration if a peace deal is ever to be reached. “We must not create a new Bosnia in the Eastern Mediterranean”, said Özersay. Michael Daventry reports. Peace on Cyprus can only be achieved if the sides agree on a detailed plan to reach it, the chief Turkish negotiator has warned. Kudret Özersay said the island’s Greek and Turkish sides shared the same objective for a settlement but had no structure to their negotiations. He added his side had to acknowledge the concerns raised by Greek Cypriots when they rejected the last peace plan a decade ago if a settlement was to be reached this time. 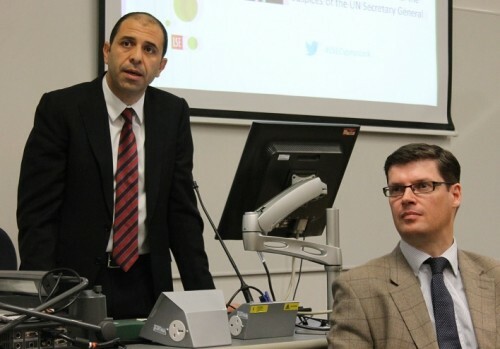 “If we are willing to achieve something that is viable and sustainable and if we don’t want to have a failed state like the one in Bosnia-Herzegovina, we need to take into consideration the concerns mentioned by the Greek Cypriots since 2004,” Mr Özersay told the audience at the London School of Economics on Monday. The Turkish side endorsed the Annan plan in a referendum that year, but it was overwhelmingly rejected by the Greek Cypriots. Mr Özersay said his current talks with Andreas Mavrayonnis, his Greek Cypriot counterpart, had already yielded results but that difficulties remained. He said the two sides had resolved “some of the core issues” on the kind of country Cyprus would become, from its federal parliament to its judiciary. They also agreed on the formation of a federal police force, he said. But “serious difficulties” remain in overcoming the burdensome issue of property ownership on an island that was divided following the Turkish military intervention of 1974. Thousands of Greek and Turkish Cypriots fled from their homes to opposite ends of the island when fighting broke out and have never been able to return. There was an instinct, Mr Özersay said, to leave the most sensitive issues to the end of the talks. He said the negotiations needed more structure if they are ever to succeed: “If we discuss and agree on a road map regarding the process it will enable us to bring all these outstanding issues [that] the parties are not willing to negotiate or fix at the early stages of the talks. “It can be part of a package deal that [will allow both sides] to negotiate more meaningfully these sensitive aspects for the people. He added both sides should “not be afraid” of greater international involvement in the talks, even though they had agreed that no foreign powers should arbitrate in the negotiations. US Vice President Joe Biden visited the island last month in a bid to boost the talks, and on Monday Mr Özersay met David Lidington, the UK minister for Europe, in a sign of increased British involvement in the peace talks. But so long as there remained the “absence of a mutually hurting stalemate” on the island, a solution would be difficult to reach, Mr Özersay said. This entry was posted in Bosnia and Herzegovina, Cyprus, LSEE events and tagged Andreas Mavrayonnis, Cyprus, David Lidington, James Ker-Lindsay, Joe Biden, Kudret Ozersay, Michael Daventry, Northern Cyprus, Turkish Republic of Northern Cyprus, United Nations. Bookmark the permalink.